Have you undergone your industrial training? and about to put down your experience on a written form?, here is a Sample of Industrial Training Report writing that will guide you on how to write your own report with ease. It is the gap between practical aspect and theory aspect of either agriculture, environmental, medical science, sciences, engineering and technology and other educational programs in Nigerian tertiary institution. The word SIWES (Student Industrial Work Experience Scheme) was introduce by the federal government in the year 1973 to develop the technological, physical and social skill of our nation. It is a six (6) or three (3) months industrial attachment taken in 200, 300, 400 or 500 levels of the degree program depending of their course of study, where the students go to various establishments related to their course of study to acquire more knowledge and technical skills in their various fields of study. The programme was initially introduced in Nigeria by the Industrial Training Fund (I.T.F) which was established under Decree 47 of 1971 by the Supreme Military Council headed by General Yakubu Gowon as amended in the 2011 ITF ACT. Its core objective is to reduce the percentage of foreign participation in most of Nigeria’s economic activities, accompanied by the promotion of locally oriented skilled manpower into the vast economic sector, and for this purpose, it led to the birth of SIWES (Student Industrial Work Experience Scheme). The Student Industrial Training Scheme (SIWES) is a skill training programme designed to expose and prepare students for industrial work situation which they are likely to meet after graduation. Participation in SIWES has become a necessary pre-condition for the award of diploma and degree certificate in specific disciplines in most institution of higher learning in the country in accordance with education policy government. Provide avenue for students in the institution of higher learning to acquire industrial skills and experience in their approved course of study. Prepare students for the industrial works situation which are likely to meet after graduation. Provide students with an opportunity to apply knowledge in real work situation thereby bridging the gap between theories and practices. Enlist and strengthens employers’ involvement in the entire educational process and prepare students for employment in industry and commerce. Attend SIWES orientation programme before going on attachment. Comply with the establishment’s rule and regulation. Record all training activities done and other assignment in the log book given by the institution. Complete SPEI from ITF, FORM 8 and get it endorsed by the employer for submission to the ITF. To make thorough explanation of the work done during my six months industrial training. 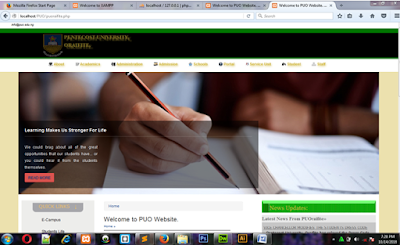 To fulfill the requirement for Bachelor of Science (B.sc) in computer science. To contribute to the body of knowledge and to enhance the understanding of the writer about a similar job or same job. 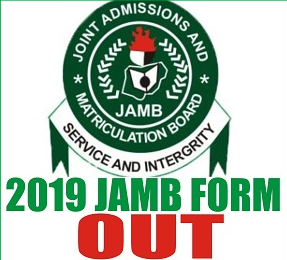 · The logbook is issued to student on attachment by the institution was used to record all daily activities that took place during the period of attachment, and it was checked and endorsed by the industrial based/ institutional based supervisors and ITF during supervision. 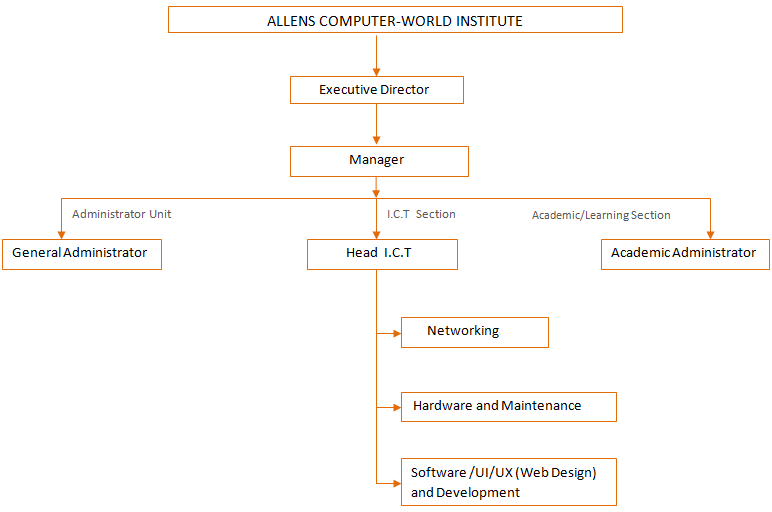 · Allens Computer-World Institute is a private non-governmental organization established in the year 2012. It owned and managed by Mr Okpako Allens.O. It is an institute basically for computer learning. It operates ICT unit which was established in 2014 with the aim to assist the institution realize its mandate of innovative use of ICT services and products to support research, learning, teaching and administrative processes and it was the unit in the organization where industrial training students carried out their training. Science academic for training and skill acquisitions in nearly every aspect of IT of some of which include engineering section, repair and maintenance, programming and computer graphics. 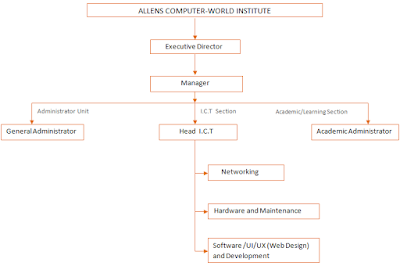 · The ICT unit at first introduced networking and hardware maintenance which was active and functional for some years before other skills acquisitions like web design and programming, graphics design and other related skills which was the unit and area/packages I took part during my training. · The organization is head by the director and administrative manager next to him followed by the engineers, system analyst and the instructors. This is the most popular section in the ICT department. Most sections in the organization uses computer connected to the internet; therefore this department offers a range of services. The server room contains a huge server that serves the organization. Networking department in this very organization controls the affairs of other departments because it has to see the connection of different computer in the organization in order to share files from one system to other and also shares data on access to the internet. I was fully engaged in this department after being through with the web design department. I was privileged to handle some of the department networking devices. This section of the ICT department is also popular as a result of the number of laptops and desktops in the organization. Once in a while, people in this part of the organization go round the organization to do troubleshooting on some systems and also update outdated operating systems and replaced crashed operating system. Also spoilt system or system part are brought back to the ICT department where they will be worked on.